Well, they WERE for sale, but they've been snapped up. I had my eye on these recently, but forgot to watch it in 'My ebay' and missed out. I was only really interested in the photo album. The album looks as if it had official and unofficial pics in it. Aye Ken, according to the seller the photo's were taken by the bands OFFICIAL photographer. I would have liked those. Not sure whether I would have parted with 30 odd quid to get them though. Never mind, it's always worth looking on ebay in the Ultravox listings now and again. Aye Ken, according to the seller the photo's were taken by the bands OFFICIAL photographer. Don't know who the "official" photographer for the band was, but they look like the work of Pete Still..... 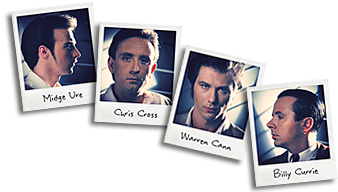 Some of whom's work (photos of Midge and Ultravox) I happen to have! Aye, I'd love to have been able to flick through them photo's. The ones you could see in the album were probably taken around 1984, possibly '86. The ones in the album are solo Midge pics from The Gift tour in 1985. The black & whites are UIS fanclub 10x8“ Walkerprints. Yes, there will be lots (and lots) of photos posted on this site from Midge & Chris' archive once Anthology is out - we've almost finished scanning them. Around 6,000 or 7,000 of 'em, in fact. Surey you haven't scanned that many Cerise! I know only too well how time consuming this can be. Even a full roll (36) of Fuji Velvia starts to get on ya nerves by the time you've finished scanning! At 4 seconds for a pre-scan that's ok, but at 3 minutes per slide for a full scan.......phew. A dinat envy yer pet. Eh up, Ash! Ta for avatar pic, I'll get that sorted for you at the weekend. Chris' are still in progress, but exactly 4,097 have been scanned to date - more by the end of the week. I've almost finished scanning the ones from Chris' which are of the most interest with regards to possible usage on our EMI projects, but there are a couple of thousand more that will still be interesting to us fans, which I'll complete over the coming months. I reckon it'll be just over 6,000 in all. I wish it was all 3 mins per scan, LOL! We're doing them at pretty high res (2700dpi), ie just over A4 size at 300dpi, so that slows things down. Plus many are water-damaged and need handling very carefully; some are beyond repair but are still interesting. Black & whites take around 4 mins per scan, but colour transparencies take about 10 mins each - not least due to ICE spot, dust & scratch removal, but it works REALLY well so I'm not complaining. Just a shame you can't apply it to black & whites!